We have retired and Heather Southard has our ewes. You can reach her at hisouthard@gmail.com, Phone (614) 915-2348. Our Olde English Babydoll sheep have proven to be a joy to own and manage. They are about as easy as any breed of sheep we have tried. The ewes are excellent mothers, easy lambers and do great on pasture. As with all sheep, they do need regular worming, feet trimming, and annual shearing but are a manageable size. Olde English Babydoll Southdown Sheep originated on the South Down hills of Sussex County, England. By the early 1800s, Southdown Sheep had been imported into the United States where they were crossed on domestic sheep to produce a larger animal which are the domestic Southdowns of today. In 1990, some of the last remaining original Southdown sheep were discovered in England. Three hundred and fifty of these Miniature Baby Doll Southdown sheep were the basis for the Registry which was started in the U.S. Adult Babydolls are 24 inches or less at the shoulder without wool. Babydolls are usually white; however, there are also black Babydolls in the Registry. They are easy to handle and are not aggressive sheep. Flocks can be maintained in a small pasture and do not require high fences. Ewes are good mothers and often have twins and occasionally triplets. Babydoll sheep have round "teddy bear" faces and appear to be smiling. 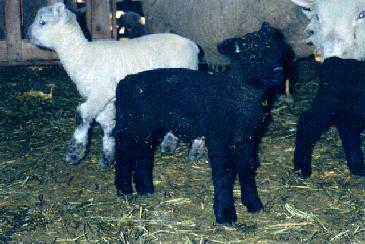 Care for Babydolls is similar to that of other sheep, including sheering, vaccinating, foot triming, and worming. Their wool is short stapled and fine with a 19-20 micron count. Their fleece also has more barbs per inch than other wool, which allows it to be blended with angora rabbit or goat fiber. 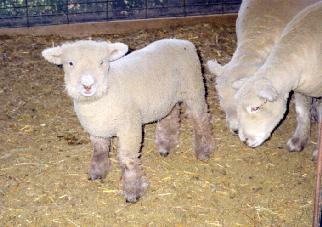 RPM Farms currently has about 50 Babydoll Sheep ranging in age from six weeks to six years. Please call or Email us for pricing, which varies depending on the quantity and age(s) of the Babydoll(s).